Finn’s aunt, Sarah, first introduced me to these fruity egg muffins. She simply added some fruit to beaten eggs and baked them in muffin trays. I have altered them slightly by adding mashed banana to the beaten egg. I mashed two bananas (very ripe ones work the best) and mixed in four eggs until combined. I then filled a muffin tray with different fruits and topped with the banana and egg mixture. I tried raspberries, blueberries, apple & cinnamon and banana & peanut butter. Both Finn and I liked the blueberry and raspberry ones the best. The juices from the berries burst into the mixture while cooking making them both aesthetically pleasing and very tasty. I definitely recommend using berries. We have had these a couple of times for breakfast now but they would also make a good snack or a treat for after a meal. Each time we have made them Finn has told everyone that he had cake for breakfast, they are certainly a hit with him. Finn usually has eggs and some fruit for breakfast so this is just a different way of serving it up and they are a great way of using up old bananas. I have added some chia seeds to the egg mixture and have also sprinkled some cocoa on top of the raspberry version. Cocoa nibs would work well too. You could also add some crushed nuts to the top to add some texture. Enjoy! Using only three ingredients these muffins are so quick and easy to make and are healthy too. Mash the bananas until smooth. Bake for 12 minutes or until cooked through. Why not try adding some chia seeds, cocoa powder or some chopped nuts? My little Finn loves these but I’m not sure how to store them or how long for? could you give me an idea of the calorie count in these? thanks! Hi Jen, I have no idea as I don’t count calories – sorry. Im sure there are online calorie counters you could put the ingredients into to get a rough estimate. Add the calories of 4 eggs, two bananas and the amount of fruit you decide to add. My little one looooved these…and he has been hard to please lately! I used frozen berries, so I had to bake them a little longer, but they were still yummy! I used frozen blueberries and strawberries and I had a lot of juice/liquid around the rim of the muffin. I am assuming it is juice from the fruit. Did you ever have this happen? Does this mean I put too much fruit in it? I am hesitant to eat them because of the raw egg don’t know if any of that liquid has the egg in it. I baked it for 8 extra minutes than then 12 min. Any help would be great!! Hi Kristin, If you cooked it for 20 mins I would doubt that the liquid had raw egg in it. I have never used frozen fruit in this recipe so haven’t had this happen. I usually cover the bottom of the muffin tin with blueberries / raspberries and fill up with the egg mixture. Can I use egg substitute instead of regular eggs and will the muffins turn out the same? Hi Felice, I have never tried this with egg substitutes so can’t comment on this, sorry. Can’t wait to try these, but I am new to slimming world and was told as soon as you warmed/cooked fruit it became ‘synable’ and not syn free, very confused ?. Please could you help me on this because your recipes are amazing. I do Slimming World too and my leader said to check the Syns Online database. “Bananas, cooked” are 4 Syns per 100g. So just look up your chosen fruit but make sure to put the word “cooked” into the search. I am not sure about eggs but I think they are always Free. Use low fat cooking spray to oil the tins or else paper muffin cups. This recipe looks amazing! I’m wondering if you have tried using frozen berries? It’s all the fruit I have at the moment – if you don’t recommend I’ll wait until my next grocery shop to make these. Thanks! Thank you! I haven’t tried frozen fruit, sorry. I must give it a go to see if it works as that would be really handy. Made them with frozen berries yesterday and worked perfectly. We have a fan oven and had it nice and hot so cooked in 12 minutes as directed. They did sink a little but we’re perfectly edible! Baby demolished the 2 I gave her last night – so much so that she ended up straight in the bath afterwards and the high chair had to be hosed down in the garden! ? Ha ha! Thanks for your feedback and glad they were a success for you! I’ve had a lot of mixed reviews on this recipe so love to hear when babies love them as much as my kids and I do! We’ve had a lot of high chair hose downs and straight in the bath episodes too! All fun and games ? how do you make the apple cinnamon? Substitute the apples for the bananas? Hi Shae, I added finely chopped apples and cinnamon instead of the fruit. To be honest the berries work much better though. ? Sort of a success! We both like them, I had two and my 11 month old had three! We made them with blueberries and would definitely make them again, however I had a couple of issues. After 12 minutes they still seemed a bit under cooked in the centre so I put them in for another four minutes. They ended up with a slightly scrambled egg texture. Could this be because I cooked them for too long or is this texture to be expected? Also, mine didn’t rise like yours in the picture so were rather flat. Any tips? Hi Hannah, thanks for your feedback! Glad your 11 month liked them! I’ve had a few people say that theirs didn’t rise like mine and I was always so confused as I had never had a problem with this….. until I replaced my muffin tray. My old tray had a much narrower base and wider top. This is the only reason I can think of. To help make them rise more try filling right to the top and increasing the oven temperature a little. I find that this can help. They definitely don’t have a “muffin” texture and are more like a sweet omelette. I make sure to use really ripe bananas so it doesn’t have an eggy taste. Ooh thanks for the tip! I am going to get a new tray anyway as mine is a bit old and had a nightmare to get the muffins out. I think I may try a silicon tray as have heard they work very well. I am enjoying trying out your recipes so thank you ? Watch out for rough bananas. Hi in sugar!! How do you clean the pan? I made these and my clean nice muffin tin is a disaster! i greased the heck out of them with coconut oil, but they didn’t come out cleanly at all!! I have soaked my pan for TWO days! Hi TK! My pan must be really good non stick as I haven’t had this problem. However I have seen a ton of info on the web about cleaning muffin trays using a dryer sheet. It is supposed to work wonders. Check out this link http://www.apinterestaddict.com/2012/06/27/an-easy-way-to-clean-stuck-on-food/ She had the same problem, egg muffins stuck on her tray. Do you realize dryer sheets are loaded with chemicals? So is your body. Dihydrogen monoxide is the chemical name for water. Everything is made chemicals, it is pretty irrational to fear them just because you don’t know exactly what they are. If you thoroughly wash and rinse the pan, you should be fine. This is coming from a really paranoid person when it comes to such things. Our bodies are full of chemicals because of what we put in them… We don’t have to fear but we can educate ourselves. Can’t wait to try these. They are in the oven as we speak. Hi Jen, thanks for your feedback! Glad your husband liked them and hopefully your little one will too. ? Hi, thank you for the recipe. Although they tasted OK, they did take longer to cook for me. When I took them out they looked risen, but completely collapsed into sticky pancakes after. Ill persevere and try them again though as yours look delicious! Hi Brianna, Thank you for your feedback. I’d try increasing the temperature of your oven. I have a fan oven and it is very hot. A few people have mentioned that they needed to bake them for a couple more minutes too. I hope you have more success next time! ? I make these a lot for my little ones 🙂 Have you tried to make them in bulk and freeze them? Just wondering if they would hold up well. 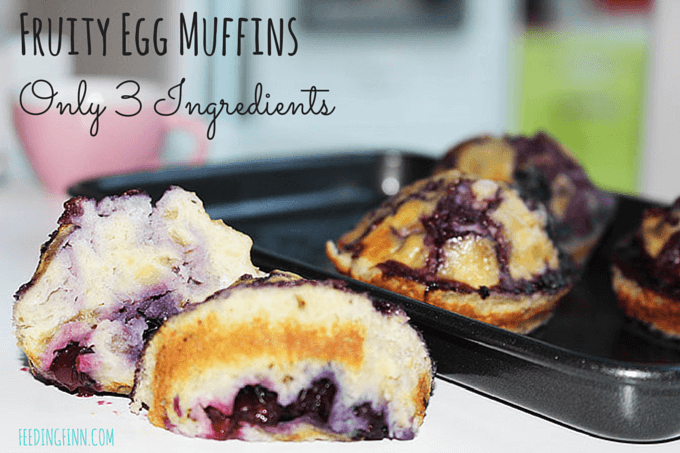 Only 3 ingredients to make delicious muffins? Yes, please! Not only that, but these incredibly simple muffins are also very healthy. Flourless and sugarless, you can put whatever berries you want inside and make these muffins totally your own. Perfect for a quick snack or a healthy dessert, these muffins are sure to be a family favorite. I tried with pineapple and it didn’t work for me. They didn’t hold together and the mixture took a lot longer to cook. I have been looking for an old WW recipe similar to this one so I used pineapple. you have to squeeze as much juice it as possible for them to turn out. Thanks for sharing. I Just made these and they turned out well… I’ll be giving my daughter them for breakfast, she’s a muffin monster and I feel better about giving her these than the sugar loaded alternatives. I ended up putting mine in the oven for about 10 extra minutes because they weren’t cooked all the way, if I left them out overnight to cool, is here a chance they could make anyone sick? I know the egg cooked all the way but I kind of forgot they were mostly egg. help! I cooked at suggested temperature and time. I cooked in fan forced oven. Mine ended up with lot of water content from egg/ banana? Is it undercooked? Then i cooked them again for 8 minutes. the base got black/ overcooked. Is the suggested temperature for fan forced oven? Hi Em, I’m sorry that the temperature and times aren’t working for you. I have a fan oven. I do often have to reduce the temperature and / or times when I cook according to other recipes so perhaps I have a particularly hot oven. Any idea why my blueberries sank to the bottom? Hi Sara, they do sink in this recipe due to gravity. 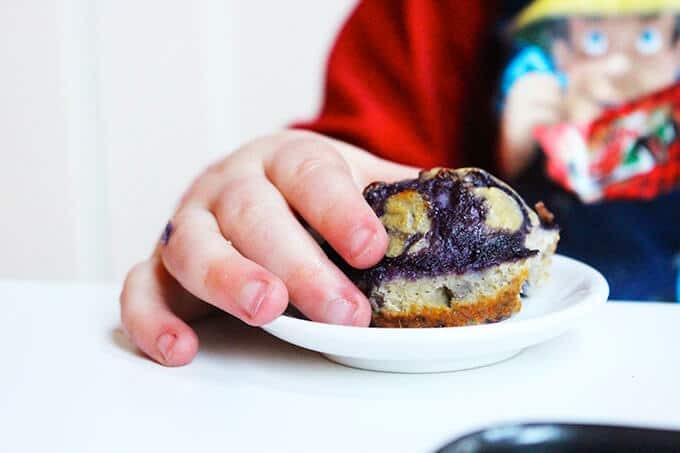 Often when you add additives (such as blueberries) to a normal muffin recipe you coat them in flour and add them last to stop this from happening. As this is just fruit and egg there is nothing to keep the fruit locked in place. You could leave the banana out but it just won’t be as sweet and will have more of an egg flavour. My little man loves these! I just tried adding quinoa to the banana/egg mixture and they turned out great. It helped to firm them up a bit. I also add ground flaxseed, wheat germ and cinnamon. So glad he likes them! Adding quinoa sounds interesting, do you just add some cooked quinoa? Yes, cooked quinoa. About half a cup. Thanks, I must give it a try! Mine came out mushy after 25 minutes of cooking, I think it might be the additional liquid from the raspberry. Also my muffin pans are for larger muffins which I believe added to the additional cooking time. Next time I will try walnuts in place of raspberrys. Well worth the try, although my flour loving husband curled up his nose! Thank you for this simple recipe! I don’t have a muffin tray (yet) but I do have some cake pans. I basically did this recipe as a cake instead. I put the egg and banana in the blender which worked really well. I did have to bake for 15 minutes and they turned out perfect. Thanks for the easy healthy recipe. Unfortunately did not have success with this recipe. I used ripe bananas, fresh raspberries, and eggs as directed. Tasted like (and had the consistency of) scrambled eggs with banana mush in it. Healthy? Yes. Appetizing? Far from it. Sorry you didn’t enjoy the recipe, Molly. I guess everyone has different tastes. When I make these they don’t last long – my kids love them (as do I). Like others, I had to bake them longer. My blueberries must have been very juicy because they were soggy with blueberry juice. Mine baked high but collapsed the instant I took them out of the oven. My family of three found these VERY bland. I’ve made pancakes before with banana and egg and liked them. I think I will try this one more time adding a tad bit of vanilla, 1/8 tsp baking powder and 1/8 tsp salt. And next time I will use paper liners. Clean up was a bear. Thanks for your feedback Regina, sorry that it wasn’t a success for you. I love the ideas of adding vanilla and hope you have more success next time. I’m worried that these will taste really eggy? My family doesn’t mind eating egg, but they hate the taste of it. Hi Nancy, yes they are quite eggy so I don’t think they will be that keen. If you do try them make sure your bananas are super ripe to mask the egg flavour. Can you use liners in the muffin tray? And if so, do you have to oil it? Hi Susan, yes I’ve used silicon liners and I would recommend oiling before hand too. You have so many great looking recipes that hard to Xu hose where to start with baby led weaning. Which once are your favorites for first month or baby lead weaning? Hi Arlene, I did a post when I first started weaning my youngest which details what I fed him…https://www.healthylittlefoodies.com/one-month-of-baby-led-weaning/ Hope this give you some inspiration. Most my recipes will be ok but where I use cheese you may want to reduce it a bit and when I use chicken stock etc try to use homemade / low salt stock or just water. Hi Orlene, I always freeze these cooked but they should freeze well uncooked too. Freeze them only a baking tray until solid and then transfer them to a zip lock bag / container ?? Just made these in mini silicon muffin pans with 2 frozen boysenberries in the bottom and a shake of cinnamon on top! Brilliant. Yummy. Ps silicon muffin pans need a lot less scrubbing with eggy mix ? Brilliant, so glad you like them! I need to get myself some mini silicon muffin pans! How long did you cook for and at what temp? 190c for around 12 mins. The recipe instructions are above. Enjoy! Nooo way, this looks amazing! Thanks, I’m making them tomorrow morning. ?? Hope you enjoyed them! My little boy (and I) really liked these. I had to adjust the cooking time and temp, but aside from that the recipe worked out marvelously. I’ll definitely make these again! Hi Neena, thank you – I’m so happy they were a hit with you and your boy! Hi i made these for me and my little boy, we loved them, i made all different ones i made, blue berry ones, strawberry ones, cherry ones and plain banana ones. I also made blue berry and strawberry and strawberry and cherrie and then one with everything in it. I taken them out my tin while they was still hot and washed the tin straight away. How long can you keep them in the fridge for? Hi Laura, Wow loving the sound of all your combinations! Glad you liked the recipe. I personally prefer to eat these straight away, they will store in the refrigerator for a few days and be safe to eat but I find it affects the texture and palatability. Sorry I took a few days to reply. I had major mac book issues and have ended up having to buy a new one! How did you find they stored? Are these suitable to freeze? Hi Helen, I have never actually tried freezing these so can’t say how they hold up. Sorry. 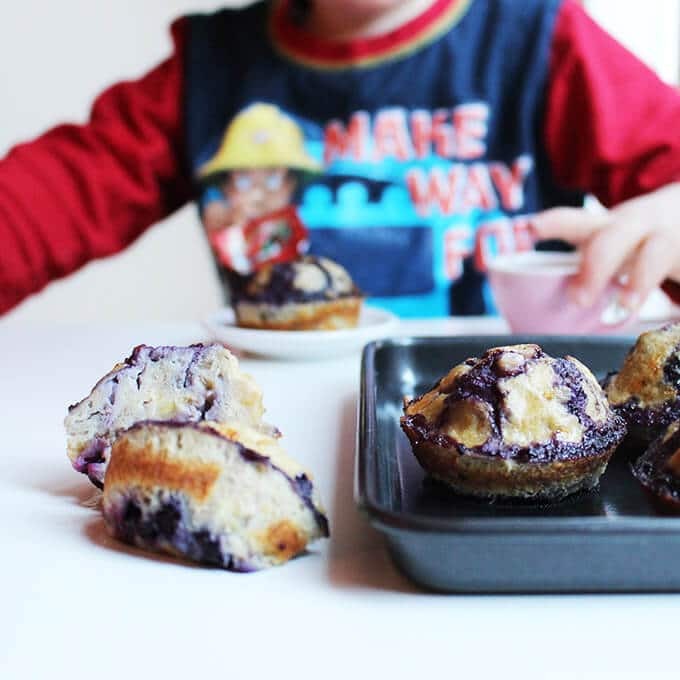 We tried these muffins with blueberry some with raspberry, and some with strawberry. Did exactly how the recipe says and they tasted awful. My son and his girlfriend tried them and our grandkids tried them . We all were grossed out. Hi Keith, sorry you didn’t have success with this recipe. My boys loved these when they were babies and toddlers! Hi I have made these twice and both times the bottoms are soggy. I have tried putting them straight into a baking tray and then into cupcake holders. If I cook them longer then they get well done on top but still soggy. Can anyone help? Hi Jenny, as they are just egg and fruit the bottoms are quite soggy. My kids don’t mind this. Are you allowing them to cool in the tray? This can cause even more moisture at the bottom. Nothing about this recipe works and was a terrible waste of ingredients. Hi Beth, sorry you didn’t have any luck with the recipe. Great! Thanks for taking the time to let me know. I haven’t made these in ages. I may just have to make a batch in the morning! Sorry you didn’t enjoy these.